Growing up in Texas, one gets used to everything being a little bigger, a little over the top, and, depending upon your orientation, a little scarier than in other parts of the country. And on when it comes to the subject of urban legends, this view certainly seems to hold true. Urban legends are based on two things, generally; superstition and archetypes. Many modern-day urban tales are based on some sort of factual event that has been enhanced by sensitivities that are fed by things such as religious/political beliefs or strong emotional opinions. In this respect, many of these are simply cases in which imaginations have been allowed to run wild, creating a hyper-reality that influences the perceptions of people who witness these mysterious phenomena. But as we see in modern culture with the rise of belief in ‘fake news’, the truth or legitimacy of an event is completely secondary to its worth as a catalyst for mass support and unconditional validation, however incredible as it may seem. So with that in mind, we begin a series highlighting some of the most intriguing ghost stories and urban myths from the great state of Texas. Out past Route 67, in the high desert of the Trans-Pecos located between the Davis Mountains and Big Bend National Park, there’s a tiny far-west Texas town in Presidio County called Marfa. The city was founded in the 1880’s as a water stop but, though blossoming during the second World War, the population growth stalled and reversed itself during the late 20th Century. In 1971, minimal artist Donald Judd moved to Marfa from New York City and began what would later become a world-renowned artist compound, recreating Marfa into an international hub for artists and creatives of all kinds. The Chinati Foundation, founded by Judd, displays massive indoor and outdoor art installations on the remnants of an old army base. The revitalized downtown hosts exhibitions and concerts, as well as the celebrated annual Marfa Myths cultural festival. 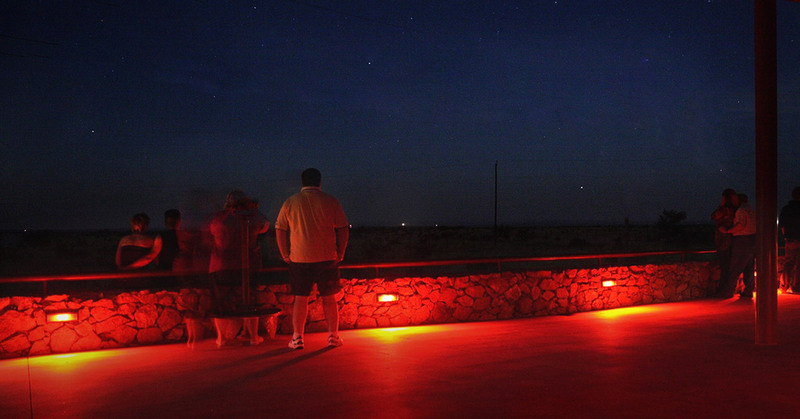 In addition to all this uber-cool stylistic fabulousness, almost as an afterthought, just outside of town, there sits a viewing platform from which tourists and natives alike may witness the mysterious orbs knows as the “Marfa Lights”. Over the decades, many people have reported seeing eerie lights in the sky. They show up randomly at dusk and move in unpredictable ways, sometimes splitting in two or merging into a single levitating source. Witnesses have suggested many theories about what the lights are: from car headlights reflected by the atmosphere to wildfires and even aliens or disembodied spirits wandering the desert. However, some scientists have suggested the lights are simply from glowing gasses released in the desert. I am convinced scientists have a true knack for ruining just about anything….